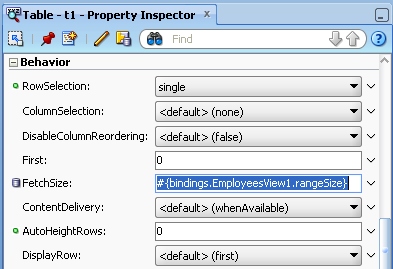 Do you remember good old feature from ADF 10g - table pagination? So many customer requests I have heard to have it back in 11g and finally in ADF PS6 we have it. Not all good features mean bad, table pagination is perfect example. Some two years back I blogged sample application for custom table pagination like behavior - Oracle ADF 11g Custom Table Pagination. Download ADF 11g PS6 sample application - TablePaginationApp.zip. There was new ADF 11g PS6 release published yesterday, check on OTN. Andrejus, when you try to run a paged table in a jspx page (not in a fragment) you need to surround hte table with a panelGroupLayout in scroll mode to see the pagination bar. There is no such warning in my sample app, because AutoHeightRows = 0 and I'm using showDetailItem - it allows to flow. I tested with simple page - pagination works for table, without wrapping table into panelGroupLayout. 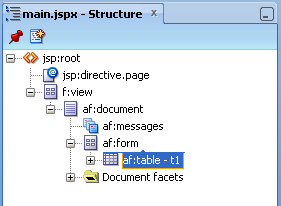 It works with table being under simple af:form as root. You should double check it. does this feature exists in 11.1.2.3? No, only new ADF 11g PS6 from this week. Thats a problem I'm facing also. I think Oracle release management is a bit strange with these R1 and R2 parallel branches. There is nothing as only to wait for 12c, when we could migrate from R2 directly to 12c. It was working for me even in simple page, just under af:form. May be its your browser issue? I was testing with google chrome. Do you mean something is wrong with my sample app? I posted updated sample app (read in this post above), where table with pagination is just above af:form. And it works well. Please test it. when I use paging in table with 2 column paging navbar does not show complete how can I fix it? You need to give enough space - otherwise it will be rendered as compact. I've tried the new pagination. I've a problem when using an edit form on a separate page fragment. When the user saved the changes I execute the iterator to refresh the data in the table.I use get/setCurrentRowKeyString to reactivate the current row after the refresh. But when I'm on a page greater 1, ADF always displays the first page in the table and not the page the row is displayed on. How can I fix this? Good question - I will check this. I am trying to use the pagination feature in jDeveloper 11.1.2.4.0 and downloaded your test project. 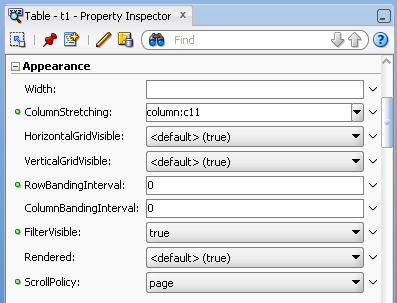 I am getting the error on this attribute on table: scrollPolicy="page". 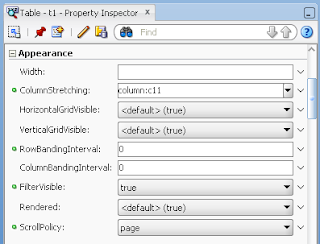 It does not show in the property inspector as well. Means you are using wrong JDEV version, should be PS6. I know I have next version of jDeveloper..just not sure why next version does not support something which pervious has introduced. You should check release notes. I've tested the pagination feature. 1. The "Last Page" button doesn't seem to work well, it advances from page 1 to 2 for example (I only have 2 pages), but the grid still displays data from page 1. 2. Can the pagination control from the grid's footer be separated from the grid? It's annoying because I have a vertical splitter, the grid is in the top facet in a panelCollection, and I had to put the panelCollection in a panelGroupLayout scrollable, so it scrolls the entire panelCollection. I want that the pagination control to be always visible no matter where the scroll is. We are using standard ADF UI components (ADF Table Pagination feature) and when all the rows fit in one page, the Page X of X (x-x of x items) is not displayed. Is this a limitation or have we missed some property settings? I am facing an issue where when I use scrollPolicy="page", and zoom in/out browser the rows from table disappears and on further action I comes back. This is tricky, it could depend on outer UI layout components structure in your page. Found solution. columnStretching was the issue.